PureVPN has started their business in 2006 offering a simple, yet very effective VPN service. Since then, a set of regularly improving the services was provided, which is resulting in PureVPN has achieved the status of one of the most advanced VPN in the world. Their servers are located in 27 countries around the world, including such exotic locations as Ukraine, Bulgaria and Singapore. Besides of increase in the number of servers PureVPN also provided a serious approach in the development of service quality: today PureVPN can be installed on almost any device from a phone to a router. Microsoft Windows: Windows 8, Windows 7, Windows Vista and Windows XP are supported. PureVPN can be installed on Windows RT manually as PPTP, L2TP or SSTP VPN connection. OpenVPN connection is not available for Windows RT, just because it cannot be established manually. You can install OpenVPN with PureVPN settings on Windows XP, Windows Vista and Windows 7; however, you will have to install it manually. PureVPN OpenVPN connection is still beta. Mac OS: All types of VPN connection are supported for Mac OS X of any version. Additionally you will be able to install PureVPN manually on any other Mac OS system. PureVPN provides the detailed tutorial on how to do this. Linux: PureVPN client software is not available for Linux. However, you can setup VPN connection manually on Linux and Ubuntu as L2TP or IPSec VPN. There is a detailed installation guide covering all the procedure. HP WebOS: PPTP VPN is supported by HP WebOS, therefore, you will be able to update your network configuration settings in order to setup PureVPN on your HP WebOS device. There is the appropriate tutorial on PureVPN official website, as well. iOS: As the rest of VPN providers PureVPN offers a profile installer for iOS that install a VPN profile with all the necessary configuration settings being done automatically. Therefore, PureVPN can be used on iPad, iPhone, latest versions of iTouch and all the iOS devices that allow VPN profiles to be installed. Android: You can setup PureVPN on any Android device as PureVPN app. There are good news for those who would like to watch Netflix or Hulu outside USA on their TVs: Chromecast, Google TV are also supported – you can install PureVPN manually as PPTP or L2TP VPN connection. 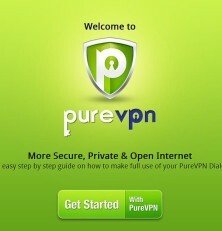 BlackBerry: You can easily setup PureVPN on your BlackBerry Z10 model just by adding VPN configuration details manually. IKEv certificate is required for this procedure – no problem; it can be downloaded directly from PureVPN official webpage. BoxeeBox: PureVPN is available for Boxee Box as PPTP/L2TP connection that is to be set manually in Settings menu. Wi-Fi Routers: It’s the best choice if you wish to empower all of your computers, TVs, gaming consoles and other gadgets in the house. You can follow the appropriate installation guide from the wide range of available ones on PureVPN site: DD-WRT, Asus, Belkin, Tomato and TP-Link routers. Keep it in mind that you will have to buy an additional router. There is no PureVPN Free Trial version, unfortunately. The only way to try PureVPN is to purchase it. If you are not satisfied with it, you can request a refund within three days. Despite the breadth of opportunities that are available with PureVPN, it has a rather simple scheme of price formation. There are only three price plans, which remain the same regardless of which device and that country you are using. Price is also not dependent on which services you need and what server you intend to use. One should agree – it’s very convenient . So, if you want to use PureVPN one month only – you pay $ 9.95. If you are interested in a six-month plan – it will cost you only $ 44.95. Well, the most beneficial plan – one year, will cost just $ 49.95 which represents a $ 4.16 per month. TIP: If you go to the “Order” page, wait a few minutes and then try to close the page – you will be offered a 10% discount on a one-year plan . Hurry up, offer remains active just for 10 minutes. All price plans are valid for up to five devices to one account. For corporate clients, PureVPN has separate pricing plans : for 25 users you have to pay $ 275 a year. 50 users you pay 475 dollars, and for 100 users – $ 925 per year. Payment methods available: Bank Transfer, Credit Cards, PayPal, AliPay, Webmoney, Yandex Money, PaySafeCard, Ukash, Giropay, Neosurf, Payza and many others including Bitcoins. Unfortunately, PureVPN offers only three day’s money back guarantee. It’s not much – but enough to make some evaluation. Of course, during this short period of time you will have no time to face all possible problems. Especially if all that three days you will simply use PureVPN to watch movies on Netflix. Therefore, we recommend that you try to arrange something like PureVPN “crash test”: try to use it in various situations – think carefully what you may have encounter the issues in the future. PureVPN is not disclosing the information about how many IP addresses they have at their disposal. However, taking into account the number of servers they have, we can assume that the number of IP addresses should not be less than 20,000. Such diversity is enough to ensure that you will be recognized as users “Anonymous Proxy” some popular video services – such as HULU, HBO and Netflix. The PureVPN client software has no option to select IP address on your own. All IP addresses are assigned automatically from the number of available on idlest servers. This is done in order to minimize the load and thus to maximize the speed of the connection. At the same time, you can always choose the country location of the server, as it is shown in the illustration below. Another option is ability to select the dedicated IP address. 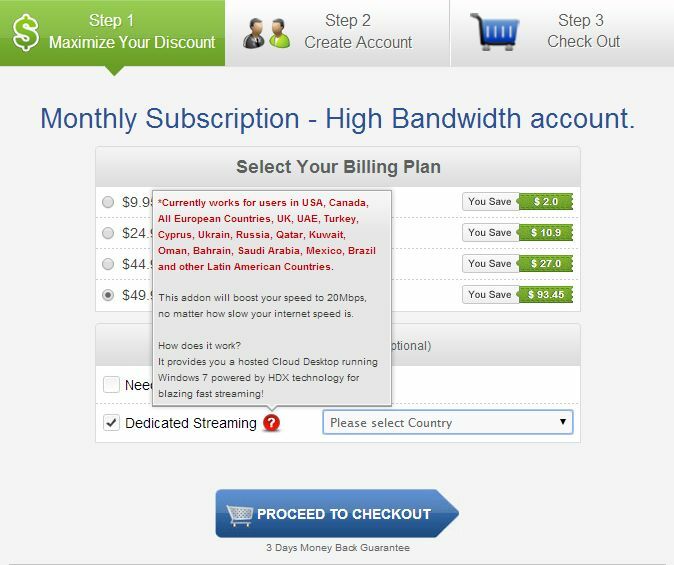 For extra 2 bucks you may have your static IP address located in USA, UK, Canada or Germany as it shown below. PureVPN does not limit the amount of traffic consumed by you: no matter which pricing package you have subscribed to. User interface is the strongest component of PureVPN. Perhaps, there is no other VPN provider with such a thoughtful combination of simple UI and an incredible amount of options that will perfectly fit your needs. PureVPN is still your choice even if you are an advanced VPN user. However, we must recognize, as our tests show – dummies initially had a hard time launching PureVPN because of the large number of possible settings and not very necessary graphs. On the other hand, PureVPN has the only client software in the industry featuring presets for various purposes: Optimum Security and Higher Security for encrypted connections (may be too slow for watching video), USA/UK TV watching (less encryption, more speed), etc. We have tested PureVPN on our servers in three different countries simultaneously. During three 24 hours sessions on each server we have experienced an average of 22 sporadic disconnections. That’s pretty much, so we have repeated the experiment several times, each time receiving the amount of connection drops in the range of 20 to 24 per day. Speed is not PureVPN’s forte. However, the average in 4,1 Mbps is sufficient for the normal Internet activities. Be prepared for possible delays and some “buffering” if you’re going to watch video in HD quality. 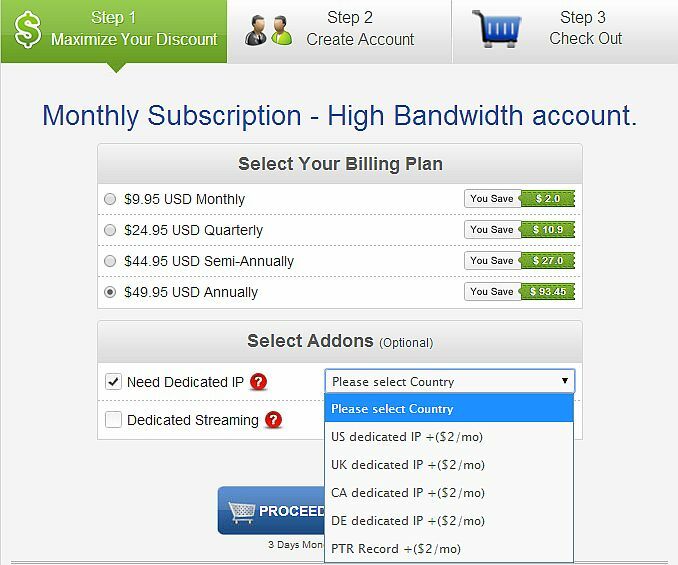 If you are not satisfied with your internet connection speed you may order Dedicated streaming which is extremely helpful in case you wish to watch Hulu Plus, Netflix or BBC from outside USA (UK) location. Want to know how it works? For additional payment amounting as low as 5 dollars per month, you will get a remote desktop access to HDX Windows 7; that will virtually bust your speed up to 20 Mbps. As the most of VPN providers PureVPN has no telephone technical support. However, you can seek help from the live chat which is available 24/7. You can also submit a support ticket and get some help by email. so far purevpn support is simply awesome. Great support with great features. I am astonished that you are getting issues with purevpn!!! I have been a customer for past 2 year and never faced any such inconvenience but always real time assistance. Excellent service with exceptional support. I can bet their support is just awesome. I think bear is having a serious issue with his PC or Internet. But i can never even think that PureVPN service is not good. I love Pure VPN service, fast,secure and in my budget too. If you’re looking for excellent VPN services, you are on the wrong track if you’re considering PureVPN. There are other VPN providers to choose from. I know it’s hard to find a really reliable one, but I’m happy to have found Astrill. Finally, I can browse with full security without compromising the speed of my internet.